On February 26, 2019, Grand Canyon National Park, located in Arizona, celebrated its 100th anniversary. The history of the canyon is about 20 million times longer. 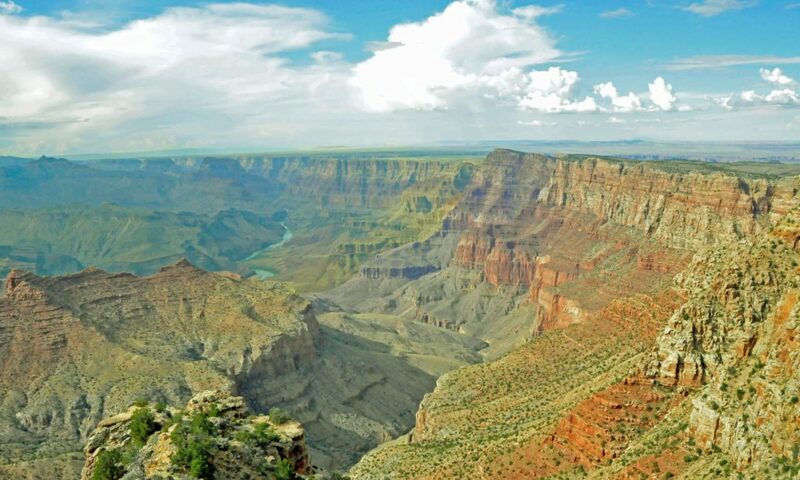 By any definition, the Grand Canyon, considered one of the Seven Wonders of the Natural World, is awesome. It is 227 miles long, up to eighteen miles wide and a mile deep. Equally awesome are the natural processes that created it. Beginning about two billion years ago, the sea then covering the area began depositing layers of sediment. Over the next billion and half years or so, about 40 distinct layers were deposited. About 75 million years ago, the geologic events that created the Rocky Mountains began to lift the area, eventually creating the 7000-foot-high Colorado Plateau. At some point, a river began flowing on the plateau toward the Pacific Ocean. As the raising of the plateau increased the river’s elevation, the water in what is now the Colorado River began traveling faster and faster toward the ocean, eroding away one after another layer of the soft sedimentary rock. The erosion accelerated and widened when the river frequently flooded from melting snow and glaciers in the Rockies. Erosion from fast-moving tributaries flowing into the river further eroded the canyon walls. With the Colorado River still about 2000 feet about sea level, the erosion continues and the canyon is slowly getting deeper. The Grand Canyon National Park offers access to the canyon’s north and south rims, with the best and most popular views provided by nine overlooks along the south rim, open year round. The north rim, open only in the summer, provides access to mule rides deep into the canyon. Access to the west rim is through lands controlled by the Hualapai Indian Tribe, which has built a hugely popular glass-bottomed skywalk over the canyon.